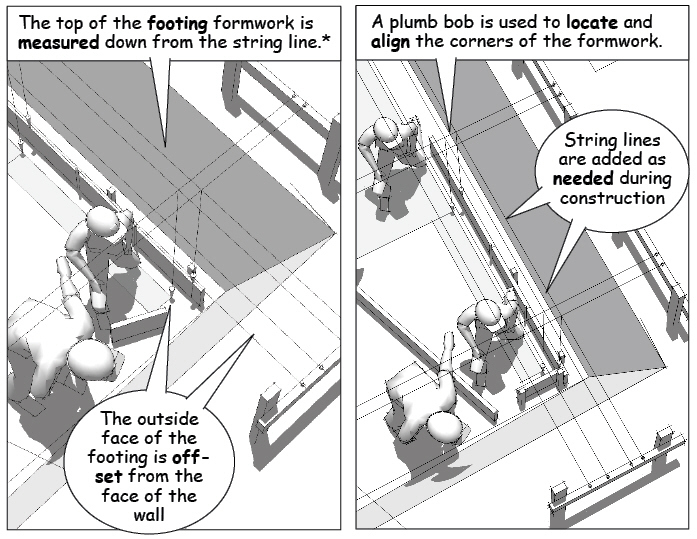 The string lines are a quick reference and good enough for most projects, but experienced builders will use a transit level to cross check the layout of the foundation formwork based on vertical and horizontal distances and triangulated offsets from the workpoint. In dense urban areas and zero lot line developments, a licensed surveyor is required to certify the location and depth of the foundation as a condition of the building permit. Zero lot lines occur when zoning restrictions allow construction right up to the property line. 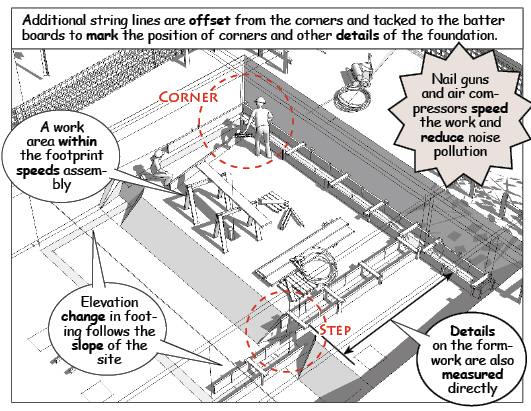 For some buildings, concrete is placed directly into a trench cut into the soil using the string lines as a reference. 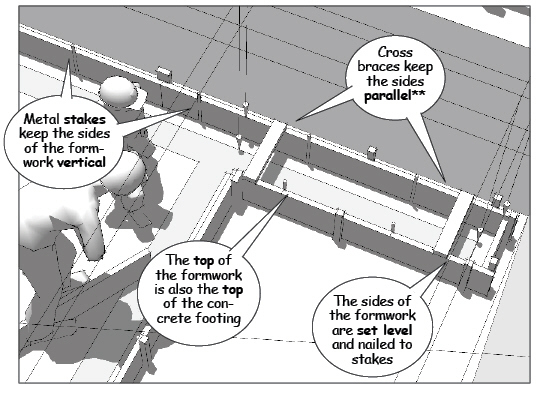 This method is commonly used for the perimeters and bearing walls of a slab or monolithic foundation. For buildings supported by piers and continuous stem or basement foundation walls, spread footings are used to distribute the weight of the building to undisturbed soil. General contractors hire subcontractors who specialize in foundations to install these footings. As masons or concrete workers, they clamp together reuseable forms, place the rebar and concrete, then disassemble the forms for their next job as soon as the concrete begins to set. In contrast, hands-on builders assemble the footing formwork using standard lumber, setting aside the material for reuse in other parts of the building as blocking or non structural framing once the forms are stripped and cleaned. 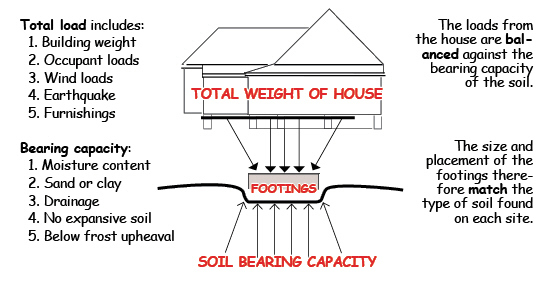 The depth and size of the footing depends on the weight and total load of the building. Dimensions will vary with soil bearing capacity, moisture content, and in some regions the soil frost line. Centering the load in this way means the width of the footing extends out from both sides of the wall above. This means the outer portion of the footing extends beyond the face of the finished wall. Technically, the footing might cross a setback line, but since it is below ground, it is most often ignored by building officials. 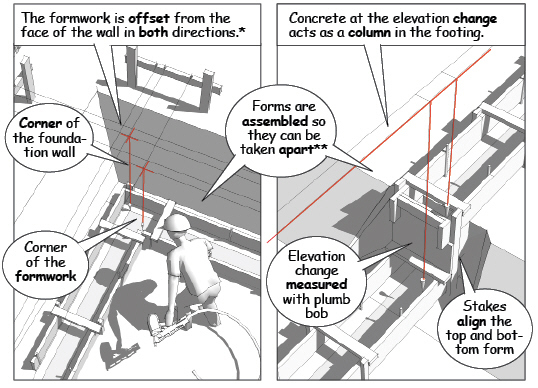 However, when the footing lies against a zero lot line with no setback, the spread footing must be engineered so that the entire foundation remains within the property boundaries.